When last we left our intrepid adventurers, they were pulling into Bahia Ballenas, the Bay of Whales, excited at the prospects of seeing gray whales “up close and personal”. 🙂 Well, life has a way of changing plans. After finding a nice spot to anchor, we lowered the dinghy and zipped into town. We pulled up on the beach near a row of fishing pangas – probably thirty of them all neatly lined up. We’d read that we wouldn’t be able to go up into the estuary on our own, but rather that we would need to hire a guide. So we wanted to make those arrangements for the next day or two. Perhaps some of the pangas were actually used to take tourist-cruisers up to the estuary? We wandered down the main road, looking for some sort of shop or sign advertising whale-watching, but we saw “nada”. Los Abreojos is a thriving town, but tourism doesn’t seem to be their game! Eventually we stopped at a little convenience store and asked where we could go to see the whales. Of course the question didn’t come across as clearly as all that, and the woman at the counter uncertainly pointed us towards the fish packing plant. Hmmm, well there were a few guys standing around the doorway, so we went to ask them if they knew where we could go. Our Spanish is still a work in progress, and it took a lot of repetition, hand-waving, and puzzled questions before someone finally went and retrieved a Chinese woman who apparently works in the kitchen but speaks a passable amount of English. (“We want whales”, “Hunh? You want a fish?”, “No, we want to travel to the whales.”, etc.) She helped get enough information from the fishermen to realize that we were about two months too early. Although our guidebook said mid-December through February, the peak calving season really is February. No whales (here) in December. So we moved on. We took a couple of days to get down the coast to the next great anchorage, called Bahia Santa Maria. Along the way we had a frigate bird sitting on our spring-stay, the wire running from the very top of one mast to the top of the other. It didn’t look like a very comfortable perch, but she was there for the better part of the night. For a while, there was a second one flying around also trying to get a perch – or was he looking for a date? At any rate, he didn’t stick around very long. We had a fishing line out as we passed over several likely places, and were successful at catching our first tuna. It was about 15 pounds (Kathy pulled out the bathroom scale and weighed herself holding it and then without). We cut steaks out of this one, and hope to smoke the next one (whenever that may be!). As we rounded the last corner before the big bay, we saw a whale splashing and waving his tail up in the air. We took that as a good sign. As we neared the bay but were still in quite deep water (deeper than 600 feet, where our depth gauge stops telling us anything interesting), we kept seeing unidentified floating objects. They looked like the sorts of floats that are used to mark lobster pots – but those are usually seen in about 150′ of water. At one point, we dodged a string of them, and one of them waved. What? We took another look and found that the next one had a little head. It turned out these things were actually sea turtles – *lots* of sea turtles! And perhaps it was no coincidence that this was a full-moon, perhaps this was the night that they come up on shore to lay their eggs. We didn’t find out, but felt a bit awestruck to have witnessed this great convocation of these peaceful critters. Then we went around the corner of the barrier island that separates Bahia Santa Maria from Bahia Magdalena, one of “the” destinations for gray whales to calve and breed in winter. The Port Captain came out to talk with us, and visited for 30 minutes or so. Again we learned that we were too early, so we’ve come up with a new plan. We’re gonna head on south towards the “Mexican Riviera” (where we have some guests lined up), come back to Mag Bay in February to experience the whales at the peak of their “season”, and then head north towards La Paz and the northern Sea of Cortez. Before heading out, we took the kayaks out for a short explore. We stopped at a small pebbly beach with some palapa cabins nearby, but no people. There was (most of) a fairly recent whale skeleton here. There was still a little bit of flesh between some of the bones and along the flukes of the tail. The skull was more than 5 feet long, and the tail flukes were close to 7 feet wide. Being close to this made us feel quite tiny. We combed the beach for a few minutes and found small sea urchin skeletons and sea biscuits, more delicate remains of abundant sea life. As we set sail for Cabo, we decided that we wanted to try to sail the whole way, without motoring even if/when the winds got light. This decision was easy to make when the winds were fresh and going our way, but it was harder to keep when they died down overnight. We originally thought that we’d make the 170 mile trip in about 36 hours, one night and the two days on either side, but it turned out to be nearly 24 hours more than that! And for a while it was looking like it might even be longer still. But the winds picked up again the last 6 hours as we approached Cabo San Lucas and rounded the point of the peninsula – hooray! Then they *really* picked up, and we were flying around the corner at more than 8 knots, and that was without our mainsail. 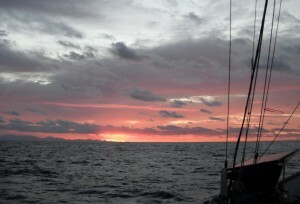 It was exciting, and we were pleased that we were able to make this longish passage under sail. We’ll need to do this more and more often if we expect to sustain the budget that we’ve set for ourselves. We dropped anchor outside Cabo’s harbor just after sunset. There were a number of other boats nearby when we went to sleep, including a huge cruise ship just anchored out with us. Cabo’s harbor was, as we’d heard, *very* crowded, and crazy-full of traffic of all sorts. As the day heated up, tourist boats zipped people out to go fishing, parasailing, sailing, and just to see the beaches. There were glass-bottom boats, party boats, jet-skis, and paddle-boarders. Resorts lined the beaches, and we could hear their music and DJ chatter all day and into the night. We took the dinghy into town to try to accomplish a number of errands. We followed the sea lions right into the inner harbor, where all of the marinas are located. There was a string of pelicans that almost looked like traffic separators. We got most of our “chores” taken care of the first day (and a couple of items that will have to wait until a larger city like Mazatlan). We also spent half a day just hanging out on the beach, near the famous Land’s End rocks. We found ourselves a quiet little corner between two rock spires, and read, collected sun, and watched people. There were lots of tourists here, doing essentially the same thing as us, and lots of boat traffic. Many of the tourists were snorkeling, and we were worried that someone was going to get run over by one of the tenders picking people up, but fortunately we didn’t witness any tragedies this day. 🙂 We considered snorkeling ourselves, but the water still seemed too chilly and the scene too chaotic. That evening as we were cooking dinner on the back deck, we noticed some odd movement of the small fishing yacht next to us. It had been anchored the whole time we were there, with no sign of life. 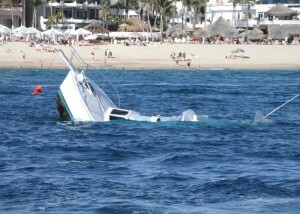 We don’t know the cause, but this boat sank, right before our eyes. It started listing, took on more and more water, and it was probably less than five minutes from the time the waves first slopped over the side until there was nothing but the very tip of the bow visible. We felt powerless to do anything. A flock of jet-skiers circled round almost immediately, and a couple of tourist boats came to see what was going on. One of them communicated with the port captain, and in about five minutes a rescue boat came out to survey the situation. They left and came back with some divers. Then they left again and all was quiet near the somber scene. It was sobering to us how quickly the boat sank, and the thought that the owners were going to return from wherever they were to find their pride and joy a submerged wreck. We decided to leave the next day, to find a less crowded beach. 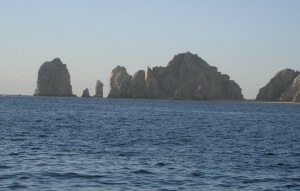 We identified Cabo los Frailes (Friars’ Cape) as a good place to launch from for the journey across the Sea of Cortez. We were also looking forward to a bit of hiking, some snorkeling and perhaps diving too. We assumed that the town there would have a cell-tower for our internet connection, but we were mistaken – sorry for the long delay in getting this update out! On the way, the winds died out completely and we were losing ground because of a slight bit of out-going current, so we ended up motoring most of the way. 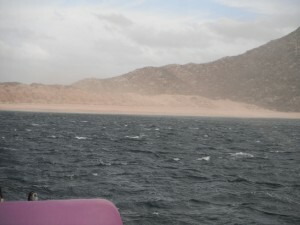 It turned out that we arrived just before the start of a weather pattern in the Sea of Cortez called a Norther. This is caused by an extreme pressure differential between the southwest US desert states (say around the Four Corners area) and the southern Sea. It happens fairly frequently this time of year, and it sets up a very strong wind (anywhere from 30 to 50 knots or maybe more) straight down the length of the Sea (600 miles) for several days. Apparently most people just hunker down and wait it out. We had stumbled on one of the common choices of a place to wait it out before crossing. We ended up hanging out at Los Frailes for a full week. It’s a beautiful little corner, although we were “stuck” on the boat half that time as the wind howled around us. So we did some projects around the house. 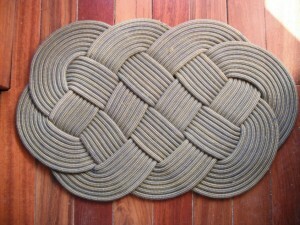 We made an entry mat from one of Kathy’s old climbing ropes, and we’re very pleased with how it turned out! We replaced the cover for the propane stove. We added some protective bars to the refrigerator, to help keep everything from sliding off the shelves on top of whatever poor soul tries to open it while the boat is heeling or rocking. We fixed our wind instruments and we tinkered with our SSB radio system quite a bit while we were here, in order to get the weather reports. Up until now, we’ve been using internet sources for this important information. Our communications are still a bit fuzzy, but much better than when we arrived. We didn’t do anything significant, but made a number of minor changes that each incrementally improved our reception. Now we’re catching more like 75% of the weather instead of 25%. There are a number of “nets” set up at given radio frequencies and various times across the day, where people from around the area can call in and give their location and local weather conditions. This is also an opportunity for people to connect with friends in distant portions of the region. Sometimes people will have a message relayed through a third-party if they can’t make contact directly. They are in general amiable and informative arrangements. And we’re now beginning to tap into them – hooray! The next step will be to hook up our modem to the system so we can request weather information via radio-fax and email. The wonders of modern technology! While in Los Frailes, we saw some interesting wildlife behavior. We saw a sea turtle come up on the beach late one afternoon and dig a hole into which she disappeared. In the morning there was no sign she’d ever been there. This was at the new moon. We’d thought that they laid their eggs at the full moon, so now we need to learn whether we were confused – or she was! We watched a sea eagle (osprey?) catch a fish right outside our window and then struggle against the winds to get ashore to eat it, or perhaps bring it to a nesting mate. Numerous times we saw some small rays jump out of the water. They would pop up about 4 feet, flapping their wings as if they wanted to join the pelicans, then lose momentum and splash back down into the water. We’d see 5-10 “pops” in a group. One woman we talked with (Linda from Jacaranda) has nicknamed these guys “popcorn rays”, and that name has caught on with us. While waiting out the wind we’ve gone skin diving for the first time on this trip. The diversity of sea life was wonderful with schools of brightly colored tropical fish. The water is about 70 degrees here so it’s still pretty chilly after about 30 minutes, but it provided a delightful taste of things to come. On Thursday we finally felt that the winds had died down to the right point for us to take the leap and start our passage across the Sea of Cortez. The first 6 or 8 hours were fast and thrilling, then the winds died down a bit and we had another 4 or 6 hours of gentle sailing. This was really wonderful, however the winds continued to weaken and we ended up drifting most of the night. We hoped/expected things to pick up as the day warmed things up, but the sea stayed mirror-like and we lost our new-found resolve to sail wherever we go. 🙂 We motored the last 30% of the way, and arrived in Mazatlan late Friday night. Today we settled in, ran a few errands in the big city, and will celebrate the New Year together on the boat tonight. It’s been an amazing year, with some incredible ups and a few downs, but we’re thrilled to be living the lives we are. Next year promises to be every bit as interesting.